As I've indicated, my last day of employment came and went early in March. I was asked to make a trip to the company's new digs to deliver some IT equipment, and I can tell you that the new place is a Taj Mahal compared to the shoebox we had been working out of for five and a half years. And, true to the end, my boss kept trying to get me to move. Sorry, boss. My wife and family are situated, I'm staying put. Thanks for asking. I'm starting to get some things moving on the job front. Until then, I'm going to pick up a few shifts at the local hobby shop. I've always enjoyed my times working at hobby shops, because, well, I was working in a hobby shop! Nobody will get rich by doing so, but I enjoy meeting the customers and helping them either find a hobby or enjoy the one they already pursue. Being the seminar coordinator, I decided that I'd present two of my own. One will cover the convention theme of "Every Model Tells a Story", the other was going to cover piston-powered airliners. But at some point I was asked if anyone was doing a seminar on model building basics. At the time, I was struggling to find material to fill out an hours' worth of propliners, so I switched tracks and started to put together a Back to Basics seminar. In order to do better illustrate the Back to Basics seminar, that means one thing: I needed to build a model. I had recently purchased some SIDNA from a club member, one of which was the Hasegawa 1/72 Beaufighter Mk.21. It is a neat little kit, and even with the advent of the new Airfix TF.X, it still is a worthy kit. I grabbed it off of the stack, and as of about an hour ago it was basically sitting in completed sub-assemblies. I'd like to have this one done quickly--I am also using is as my "Get your mojo back" model, so the sooner I can call it done, the sooner I can move on to other kits. This will sound strange--between my last days at work and the start of the AMPS convention, I actually started another kit, too--an Aeroclub 1/48 scale Gloster Gamecock, which was also bought as SIDNA from a friend at a swap meet. It has been a while since I tackled a vac-form kit, but after knocking some rust off I have found the project to be rather enjoyable. I still have other kits to finish--most of which are at the paint shop phase--but something told me to start the Gamecock. I don't know, maybe I started the Gamecock so the dogs in my head would stop barking, but I'm making fairly good progress and am actually trying a few new techniques that I've read about. Now that this one is well under way, I need to finally go looking for an Aeroclub Gauntlet for my 74 Squadron collection. My wife and I did get a chance to take a few day trips--one of them was to see our friends at the Augusta HobbyTown USA. We deliberately make a note of Master's weekend and stay away, but the weekend after the golfers leave is usually pretty tranquil. In the theme seminar I'm presenting, part of it covers a story of a model of an AV-8B. Long story--I'll write a post about it after the convention--but the gist is that I decided to obtain the Kittyhawk Models 1/48 F-35B as a companion piece. Give me a while, and I might actually get it built. Kitthawk's kits carry a reputation online, but I've witnessed firsthand that they are not impossible to build. My wife has finished both their T-45 Goshawk and the TF-9J Twogar, and they both are excellent models. Our other day trip was to the the big city of Blue Ridge, Georgia, home of Free Time Hobbies. I've bought from them online a time or two, and their selection they show online called to us to go for a visit. We left the house at about 9:30 AM and got home around 8:30PM. It isn't really a long ride, but the drive takes you through a lot of rural areas. The store is quite nice, and we managed to find a few things we needed. It isn't a trip we'll take every month, or even every six months, but it was a trip we were glad we took. We had planned to leave the house earlier on our trip to Blue Ridge, but when my wife was summoned awake by the Mighty Tiger (who had a Tiger Food Low Level Light come on), she noticed our little cat wouldn't leave the back window, and she kept hearing a cat crying. She assumed it was the little guy, but when she looked outside, she saw another cat on the porch. We had seen this guy a few times before--a youngish cat, gray in color--when he would camp out on the porch. This time, though, something wasn't right. The cat was sitting still with his head into the corner, not moving much, and every now and then would shudder, as if he was having a seizure. It had been a cold night, but we don't know if that factored into what was going on. After a while, not knowing what was happening, my wife called Animal Control. Since it was early, the Sheriff's Office responded. The deputy kept checking on the cat every now and then, and it was evident that the little kitty wasn't doing well. By the time the Animal Control officer arrived, the cat was more or less motionless. It did wiggle when she tried to pick it up, so she gave it a sedative before she loaded it into a carrier and took him away. We don't know what happened after she took the kitty away, but we're fairly positive it is playing a golden harp. What nobody could figure out was what happened. It seemed to be paralyzed on one side, as if it had suffered a stroke. We don't know if it had been poisoned, we don't know if it met up with a snake and been bitten, we don't know if some cruel person or persons did something to it. All we know is that our little guy sat inside the whole time, looking after the injured cat. And, when our little guy would start crying, his big brother would walk over and lick him on the head. So much for being ferocious beasts--our two feline gentlemen proved that they do love each other. This story illustrates why both of our feline justice units live indoors--in our area, predators lurk in the woods. It doesn't take long to become a snack for a Red-Tailed Hawk, an eagle, or a fox (or even a stray feral dog or another cat), or meet up with a rattlesnake. No, they do just fine in the house--the little one gets into enough mischief inside, I can scarcely imagine what he'd do in the great out of doors. Be good to one another, and, as always, I bid you Peace. By the time you read this, we'll be on our way to visit the old stomping grounds. We'll be back before Christmas, when I hope to have plenty to share--and the time in which I might just do so. Until then, thanks for reading. As always, be good to one another. I bid you Peace. This week saw Smokey visit the vet for his second round of shots, some tests, and his de-milling. All went well--except that one of Smokey's Family Jewels hasn't descended, so he's still half-armed. The vet said he'd look at things in a month and decide what to do. All other tests came back negative--no FIV, no Feline Leukemia (FeLeuk). He also swabbed a sample from his right eye to have cultured, so we'll see what happens there. Meanwhile, we have a prescription to treat whatever's irritating the eye. Since all indicators pointed to Smokey being a healthy cat, my wife decided to let Smokey out of the Master suite and into the rest of the house. I wasn't home, but I understand things were a bit tentative. Smokey, being a young cat, wants to play. Junior, who has been King of the House for eight years, isn't thrilled with the new addition. There have been a few moments between the two, but for the most part, they've done well. There have been a few moments--my wife had to use the spray bottle on Smokey earlier today--he's treating everything as his--including Junior's sandboxes and food bowls. Now, just look at Junior--the last thing he needs is another food bowl, yet he's eyeballing Smokey's. I guess Junior feels that what's good for one is good for all. We're trying to keep Junior from Smokey's food bowls and Smokey from Junior's kitter boxes. It seems to have calmed Junior down a bit. I'll be judging tomorrow at the AMPS/Central South Carolina Chapter's Inaugural Contest. I'll post pictures as I'm able. We're hoping we get a decent showing--we're co-hosting the show with the Midlands Chapter of the South Carolina Modeler's Association. I'm looking forward to a fun day. The busy week has taken its toll on my sleep, so that's all I have for you right now. Thanks for reading. Be good to one another, and I bid you Peace. Any fan of World War Two warbirds knows the Consolidated PBY Catalina/Canso--the ungainly-looking, high wing flying boat/amphibian patrol aircraft. Well, I made the acquaintance of a few of these aircraft in my career, the first of which was a Boeing-Canada built PBY-5A Canso that the company I worked for acquired back in 1989 or 1990. She wasn't much to look at--after the war, she had been modified to what was known as 28-5ACF and was to have been used as a freight hauler or firebomber. During that change, she had her waist gun blisters replaced with cargo doors, and she had the later "clipper" nose fitted that eliminated the gun turret and window--these modifications removed a lot of the character that made a PBY a PBY. But I got to do a little avionics work on her, and other than reminding yourself that there are lots of places to bang your shins or whack your head in this old girl (and there are two kinds of people who work around flying boats--those that have knocked their head or shins on something, and those who will! ), it was more or less a joy. Yes, there was oil all around, too--any radial-engined airplane will have a film of oil covering most of the airplane after too long, and this PBY was no exception. Doing some research, it seems that my first PBY was a bit of a celebrity. She was born as Construction Number 22022 and went to the Royal Canadian Air Force as RCAF9793 sometime in 1943. After the war, she kicked around a bit--she carried, at one time or another, the following registrations: YV-P-APE, OB-LDM-349, HK-996X, HP-289, HR-236, N6108, and TG-BIV. I knew her as November Five Four Zero Four Juliet. Zero-Four Juliet stayed with us for a year or so. I'm not sure what we did to the airplane up until 1990, but there came a time where the maintenance guys went to work doing some sheet metal work. They were adding seat rails and a passenger floor to the airplane. They were also re-routing all of the overhead fluid lines--we were told that she was to be ferried to New Zealand, where she would haul passengers, and you can't have volatile liquids (read: 100 Low Lead Aviation Gasoline, aka 100LL AVGAS). As it turned out, she was actually going to be brought to New Zealand to be used as a flying museum. Unfortunately, it would not come to pass--at least, not for Zero Four Juliet. The airplane left our facility sometime in late 1993. I heard little about her until a friend told me that she crashed in January 1994 while en route from Hilo, HI to Papeete in French Polynesia. She sank in the Pacific. Fortunately, the occupants were rescued. N5404J, serial number 22022, was built by Boeing of Canada and had the RCAF Serial 9793. It was originally a Canso A (PBY-5A) but at the war's end was modified in Costa Rica to 28-5ACF status. Its blister windows were removed. It had R1830-94 engines. It was never used as a water bomber. Ownership changed hands at least eight times. Registrations have included: YV-P-APE, OB-LDM-349, HK-996X, HP-289, HR-236, N6108, TG-BIV, N5404J. 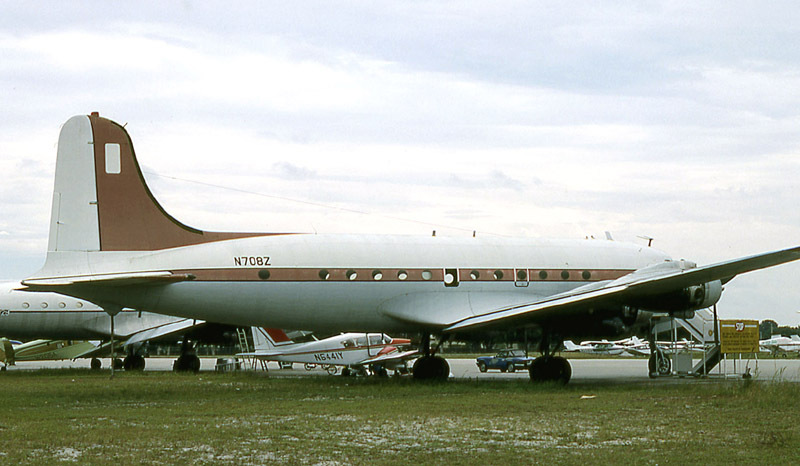 It took part in the ill-fated "Bay of Pigs" operation in Cuba during which, while circling the invasion area and operating with the code name "Swan Island", its mission was to act as a communications relay aircraft. It was also used in making of the film Tora, Tora, Tora, flying in pre-war US Navy colours both as 24-P-4 and 24-P9 representing PBYs from VP-24 based on Ford Island, Pearl Harbour. It was hired at one time by renown marine biologist Jacques Cousteau on one of his ventures (Jacques Cousteau’s son, Philippe was killed in PBY-6A Catalina N101CS –"Flying Calypso" in a water landing accident). N5404J's last registered owner was The Catalina Company (NZ) Ltd under which the registration ZK-PBY was reserved but never taken up as the aircraft forced landed and sank in mid-Pacific early on January 14, 1994 during a ferry flight to New Zealand. For the whole fascinating story order a copy of Catalina Dreaming from this site today! My second encounter with a Catalina happened about the same time--it was the airplane now known as N4NC, and maybe I'll tell you about it (and other hangar stories) some time...for as Zero Four Juliet was a workhorse, Four November Charlie was a flying yacht. As I hinted at above, work has been more than hectic these past three weeks. I haven't had much time to do anything, so forgive me on the lack of updates lately. Thanks for reading, and, as always, I bid you Peace. This has been a busy week--well, maybe not so much busy. I guess the word I'm looking for is out of the ordinary. This week every year is like that for me--the post-Le Mans let down, for one, gets to me. Of all the motorsports events that take place around the world every year, this has got to be my absolute favorite. And, because of that, I tend to want to watch all of it that I can, which leads to sleep deprivation, which slows me down for the following week. We've also got an airplane in the final phases of an inspection, and that's when things tend to get hectic. Parts are arriving, final checks are being done, and everyone is working to make sure that A: the airplane gets done when promised and 2: we don't miss anything or compromise the safety of the airplane in any way. Believe me, there are times that the latter provides enough stress to last a month of Sundays. And, an additional factor is the heat. The calendar may indicate it is late Spring, but here where I'm at, it is most definitely summer. The hummingbirds are back--we've put both feeders out for them--and the whip-poor-wills are hanging around in the evening, singing away. Even those annoying gnats--we refer to them as "dog-pecker gnats", since they tend to congregate around that particular part of canine anatomy--common to South Carolina are back. Most telling is the heat and humidity. We're going on maybe 20 days where the daytime high has been at least 90 degrees so far this year. We've not had a lot of rain, either--although the skies did open up on Wednesday evening and knocked power out for several hours, we haven't had a good, steady rain in quite some time. And while the weather-guessers and meterolog-ities (you know, "celebrities" who guess the weather--folks like Al Roker and Jim Cantore) will tell you, "It will be a hot one, stay inside! ", they don't say what to do when your job consists of working outside year-round. The best we can do is stay hydrated and keep the fans running, but even that doesn't help much. So, at the end of the day, the heat and stress take their toll. These days, my Fun Meter is usually pegged out come mid afternoon (maybe 2PM), and Going-Home Thirty can't come soon enough. On other fronts, the local IPMS Chapter held their monthly meeting this week. There was a good number of models on the table for show and tell this month--I'm always interested to see what others are doing, and this month's turnout was a treat. At the same time, the local AMPS Chapter is in the final planning stages for our Inaugural Show/Contest, so things are getting busy on the hobby front, too. As usual, I'm trying to keep some build momentum working, but I hit a bit of a snag this week. I shot the silver paint on the NASCAR Monte Carlo this past weekend, so that I could start putting the decals on this week. Well, a decal sheet that has been kicking around in my stash for some 15 years is a little worse for the wear. The decals shattered when I tired to soak them off the backing sheet (the inks have become brittle, and the more layers of color, the worse it is), and the kit contingency decals are no great shakes, either (typical of Monogram decals from the '80s and '90s). I can touch up the decals and finesse the contingencies, but what I'm probably going to do is strip off what I have on the car and clean up the paint. There's supposed to be a new sheet of the same scheme coming out soon, and I think I can wait. After all, the project has been waiting for the past 15 years, what's another month or so? I can finish the engine and chassis, clean it up the painted body, and put it aside again--temporarily--so that I can get back to work on the A-10A and the StuG IV. I'll be happy to finally get some more projects moving along and finished. I made myself a promise--other than the Le Mans build, I will not start another project until I can get the A-10A and StuG finished. And I intend to follow through...and as soon as I can get replacement decals for the Monte Carlo, it will get finished, too. By 1938, though, the airlines were looking for a larger version of the DC-3. One prototype, the DC-4E, was built for United Airlines (you see, kids, the airlines were driving the market--they'd tell the manufacturers what they wanted, and the manufacturers would build it). With additional interest from the other major carriers, Douglas went ahead and built the -4E. It was larger, faster, and more advanced than the -3 was. In fact, it was a bit too far advanced, and the project was abandoned in favor of a similar, yet smaller design--this would become the DC-4. The DC-4 (in military clothes, it was the C-54) first flew in 1938. Powered by four Pratt and Whitney R-2000 and could cruise at 225 knots at about 21,000 feet. It was quickly drafted into World War Two service, and the first C-54 flew in 1942. Notable because of her service during the Berlin Airlift, the airplane soon faded into obscurity after the war--the military was phasing the older transports out in favor of ones with greater lifting capacity, and the airlines wanted bigger airplanes that could fly farther, higher, and faster. The USAF, USN, and the armed forces of several other nations kept the C-54's gainfully employed for many years after the war, the last ones being retired in the late 1970's/early 1980's. Our particular airframe was built where all C-54's were built--Douglas' Orchard Park facility, where O'Hare International Airport now sits. Taken up by the Army Air Force, she saw service for several years before being reassigned to the U. S. Navy as an RC-54V, Navy Bureau Number (BuNo) 45614. The RC-54V, by the way, was used as a mapping aircraft. She was transferred to the U. S. Coast Guard at some point, as well, according to one report I've read. I can find no history that suggested that she flew in WWII (unlikely) or in the Berlin Airlift (probable, since pretty much all airlift assets of the U.S. military were on call for such duty), or Korea (maybe, although she was probably performing mapping duties for the Navy at that time). The interesting part of this airplane's history--for me, at least--is after she retired from the military. My first acquaintance with Douglas C-54G-10-DO, Constructor's Number 36067, USAAF Serial Number 45-0614, civil registration N708Z, came around 1990 or 1991, when the company I worked for bought her from Aero Union in Chico, California to replace the C-54A-10-DC we recently had to retire (and that one would have been N74183, C/N 10314, USAAF S/N 42-72209. She later wound up in the Flying Leatherneck Museum at MCAS El Toro with a fake BuNo of 90392.). Zero-Eight Zulu had previously kicked around a bit--she had been owned by Southern Aero Traders and sat at Opa-Locka (just north of Miami, FL) for a while, then Aero Union had her and used her as a fire tanker. If you knew where to look, you could see where the fire suppressant tank was installed on her belly. When we got her, it was evident that the paint scheme she wore was previously painted over--there was evidence of a darker paint around the rivet heads and in some of the lap joints. Also, in the cockpit, there were a lot of phony placards painted in "Russian". Well, if you look, hard enough, there was also a fake "Russian" registration, too: CCCP-56397. And then I started to dig and ask questions--I suppose to a few of my colleagues I was off my rocker, since I was one of the few people there who actually liked working on the "pigs". I loved the history behind these airplanes. They had character; they had been places and done things, more so than any other airplane I've worked on before or since. So, as Paul Harvey would say, the story picks up in the late 1980's. Apparently, our airplane was a movie star. Well, maybe a stunt double. See, the fake "Russian" disguise was leftover "makeup" from when our airplane appeared in the forgettable 1989 flick "The Experts". The plot was that two hip Americans, Travis and Wendell, get kidnapped by the KGB, sent to a Russian town that is modeled on American society, and tasked (unknown to them) with bringing the place into the present--as it was when they got there, it was right out of "Leave it to Beaver" and "Father Knows Best". Well, sooner or later, our heroes get wise to the deal and try to get away. One of their assistants is a Russian Air Force pilot, and his airplane is their ticket out. The flying sequences were done by a C-118B (and I suspect another airplane that found employment with us), but when everything was "in the can", they found they needed some shots from inside the airplane. Since the C-118 was not available, they turned to the next best thing--yep, the C-54. Paint it dark, sprinkle a few cryptic placards around, and *voila*, we've got us the inside of a Russian transport! The paint job lasted longer than the movie did in the theaters, I fear. That was probably the highlight of Zero-Eight Zulu's career. She served us well until 1994, when she blew a jug on the number two engine during a landing. Our cargo contracts were winding down, the old propliners were getting harder and harder to find parts for--especially anything with R-2000's--and she just sat. I left the company around that time, but I know her avionics were removed and installed on a Volpar Turboliner (a conversion of the venerable Beech 18/C-45 with Garrett/AiResearch TPE-331 turboprop powerplants replacing the R-985's--another interesting airplane I might tell you about someday), and rumor was she was going to be broken up. Sometime shortly after the Turn of the Century, she got a reprieve. I learned she was being repaired and possibly restored as a Warbird. Later still, I heard she would be earning her keep in Alaska. And that, boys and girls, is where she is now--flying for Brooks Air Fuel out of Fairbanks, AK. They really tarted her up, too--she now wears a quite attractive livery reminiscent of the United Airlines of old. (With apologies to Richard Scarry.) My brother and I had a copy of "Richard Scarry's Busy, Busy World" when we were kids, and I must have read that book a few thousand times. My wife also had a copy that she fund when we visited her parents a year or so ago...I do love the way he drew cats! Add to that, last week I attended a half-day battery seminar. And, during our clean up sessions, we located three Nickel Cadmium (NiCd) aircraft batteries, two of which were still in good shape. So, yesterday I discharged them and I spent this morning tearing one down to its component parts (cells, case, thermistor strips, shims, etc., etc.) and washing all of it. Tomorrow, I'll be re-assembling it and tumbling the hardware to clean it. Once the first battery is back together, I'll do the same for the other. After that, I have two days chock-full of fun--main charge, top charge, capacity check, and a possible deep-cycle. Repeat. Locate any bad parts and cells, repair, and repeat. And, during this fun-fest, the state held a mock disaster drill next door. So, we got to watch the dog-and-pony show roll into town yesterday as they set up their circus tents and command posts and media centers and such, and got to watch today as the "victims" were airlifted in (actually, they were waiting on the C-17 in the hangar next door--after the airplane stopped, they walked across the ramp into the airplane, were "injured" or "killed", and toted back off the airplane on litters and body bags), their "injuries" evaluated, and were sent via ambulance or helicopter to the local trauma centers. A few hours later, the airplane flew off. I left work early today to tend to some personal business, but I'm told they repeated the process a few hours later. Meanwhile, a few comments on my "Thundering Jets" post of a few days ago: about the same time that I posted that article, Phil Friddell posted a piece on Monogram Models on his Replica In Scale blog. I agree with Phil--Monogram was the best in the business back during their heyday. The cockpit and other detailing was crisp, sharp, and accurate--careful painting was the only "detail set" you needed. Sure, the panel lines were of the raised variety--and we didn't care. We were used to them being that way on every kit--Monogram's were usually more petite than the others. One thing that I don't like is that these days, the Revell reissues of Monogram's classics are molded in a different plastic. Monogram used to have a semi-hard, very shiny plastic that took paint well and could be polished very easily when it had to be (buffable metallics, anyone?). Back in the day, an article in FineScale Modeler answered the question--Monogram added a larger proportion of clear styrene beads to their mix than the other manufacturers did, yielding that shiny plastic. These days, the Chinese companies that are molding the kits seem to add more vinyl to the mix, making the plastic softer. And, for whatever reason, the fit is not as good as it once was. The A-10A I'm working on is a Revell reissue, and while Monogram's original was no Nobel Prize for Well-Fitting Model Kits recipient, the Revell reissue seemed to fit even worse. These days, I'd rather buy an original Monogram issue of a kit second-hand than a Revell reissue. Still, though, Revell-Monogram kits are still a very good product for the money. And, if you are interested in 1/48th scale B-29's, F-102's and F-106's 9and many others), you go Monogram or you do scratchbuild. Since the Learjet departed our facility, I've had some time to actually sit down and do stuff--like start clearing out the model backlog on the workbench. I'm Happy to report that I've had some success at doing so, and once I get some stuff completed, you'll get the full report right here. Meanwhile, we're hitting the e-books at work--the FAA requires a certain amount of recurrent training every year. With the lull, I decided to get mine done and over with. There's nothing like sitting for several days listening to presentations on Human Factors, Lockout/Tagout procedures, HAZMAT, and the like. It keeps everyone happy, so in the end it is worth it. I'm also lobbying for more specialized training this year, too--I'm a firm believer that you can't get enough training. Be good to one another, and I bid you Peace.